In the Flesh has a tragic story to tell: in the rural, English town of Roarton, two childhood best friends became something more. Kieren Walker, forever the outsider: a kind, gentle artist who never fit in with the rougher, country villagers. The other one, Rick Macy, naturally fit in–and had to–because his father’s standards required it. Weighed down by this, and the impending likelihood of Kieren going to art school, Rick joins the military and ships off to Afghanistan where he is killed in action. Upon hearing this, and believing it to be his fault, Kieren commits suicide. Two families left in tatters. A tragedy. But what if you died in 2009 and for whatever reason (the show’s mythology is still murky), you come back. Zombiefied. Like Kieren Walker. 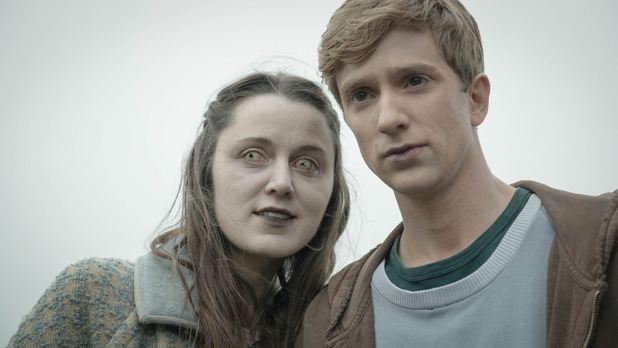 In the Flesh quickly develops mystery around its zombie canon while establishing its own ground rules. Like, for instance, it appears that only these special 2009 deaths rise up. While this isn’t explicitly discussed, it appears that this caveat makes the zombie threat manageable for the human race. The world isn’t completely overrun in one night. Also factoring into the manageability is the fact that this isn’t a virus. Human victims and those who are bitten are not transformed into the undead. The zombie population isn’t exponentially increasing in the days after “The Rising”. Another welcome change: the world is very much aware of the pop culture conception of a “zombie”. In some other fictional worlds, like The Walking Dead, the narrative treats the idea of a zombie as unheard of and novel; there are no self-aware meta moments when Rick turns to Glen and laments about their situation versus the situation in Night of the Living Dead. The show intentionally dances around and never uses the word “zombie”. In the Flesh exists in a world similar to ours, one where people have long been exposed to zombie films and basic mythology. I find this extremely refreshing to have a tale where people are actually aware of the concept, even if it might be intentional. The series might conjure to our minds ideas that we typically have about zombies to then juxtapose and highlight where differences lie with their narrative. This makes it easier for the writers to pave their own path. Not that In the Flesh over-utilizes “zombie”. It distinguishes itself with its own terminology as well: “undead” as the preferred term by many of the, well, undead; “Partially Deceased Syndrome (PDS) sufferers” as the government-created PC label; and “rotter” as the derogatory name given to them by the living. But, back to the tragedy: Kieren doesn’t stay dead. He’s a rehabilitated PDS sufferer, sent back to live with his family. And when he returns, he has a lot to deal with: a family struggling with seeing a son/brother who committed suicide and didn’t even leave a note; one of the most anti-PDS towns in England; and, the undead return of Rick as well as the continued dominance of Rick’s father. Toss that in with Kieren’s personal struggle and shame over what he has become and hesitance over joining in with other members of the undead population. But along the way he makes friends: most notably, Amy Dyer, who is perhaps the liveliest person in the town, despite being undead. I would recommend In the Flesh for so many reasons, but primarily for its power to move the viewer. For the first time ever, I can claim a zombie show actually moved me to tears. And not just a few. I’m talking about, full-on, near bawling my eyes-out whimpers. It teases out its mythology by making the viewer work for questions, while also providing satisfying answers. The series does a striking amount of character work in its limited run. Most of the characters grow in welcome ways, although some changes seem rushed and out of left field. That is perhaps the only caveat to my otherwise glowing recommendation. The writers and creators clearly have a distinct narrative to tell with multiple avenues to take the local and over-arching stories. Here’s to In the Flesh getting a chance to continue their unique examination of “life” through a supernatural lens.